 Charging Moose Media was founded by Marcus Bagala and Ned Donovan in 2016. Marcus and Ned met in high school, and have been working together ever since their first collaboration where Marcus music directed Ned's production of The Last Five Years​. Their collaborations continued into college, with Marcus at Berklee College of Music and Ned at Ithaca College, with Marcus scoring just about every film project Ned was a part of. After they both moved to New York City, Ned and Marcus continued to work together on various projects. Then in the fall of 2015, Ned approached Marcus and asked him to come onboard a music project Ned had been planning for a few years covering classic showtunes in contemporary radio genres.. The end result was called Give My Regards to Broadway: Classic Showtunes Reimagined, which released in the spring of 2016. Later that year, Ned and Marcus collaborated again on The Hunted: Encore, a spinoff series to The Hunted, the longest running web series on the internet, and this company was born. Charging Moose Media came out of a desire to create fun, exciting, high quality media projects across a wide spectrum of interests with a diversely talented group of artists. We strive to create engaging, unique, professional products that showcase our talents and the talents of the many incredible artists around us. We are always open to new ideas, and would love to hear yours. If you're interested in working with Charging Moose, please don't hesitate to reach out to us through our Collaborate page! Marcus (occasionally referred to as Moose) has composed music, designed synths and crafted sound design for tv shows, films, video games and the stage. Marcus is also an multi-instrumentalist, playing guitar, mandolin, ukulele, bass and keys performing in many venues across the north east and on the scores of television shows and movies. Originally from Portland, Maine, Ned now resides in Brooklyn as an Actor, Singer, and Fight Director. When not doing those things, Ned can generally be found playing board and/or video games, being an enthusiast of nerdy TV shows and movies, and loudly supporting New England sports teams. GO PATRIOTS! TB12 FOREVER! GOATGOATGOAT! *ahem* sorry, I don't know how that got in there. As an actor, Ned has been seen in theaters all over the country, performing in shows such as All Shook Up, My Fair Lady, Damn Yankees, White Christmas, and more. His work has been described as "Earnest", "Heartfelt", "Thrilling", and "Lovely" among others. He was once called "the minstrel with the mellifluous voice" in a review, though he had to google that word to make sure it wasn't super rude. As a fight director/stunt coordinator, Ned has worked theatrically at the regional, educational, and community levels, as well as teaching staged combat classes. His feature film stunt coordination debut Night of the Living Deb released in September 2016 to DVD and VOD. His other filmed work includes multiple award-winning college theses, web series, and a brief stint on America's Got Talent Season 6 (don't worry, he was voted off the show super quickly and subsequently made fun of by Howie Mandel #BucketListItemComplete). ​Ned holds a BFA in Musical Theatre from Ithaca College, and is a proud member of the Actors' Equity Association.